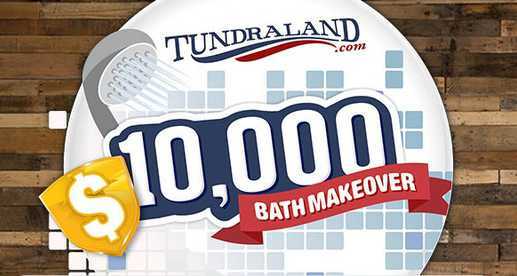 Enter into the Wearegreenbay Tundraland $10,000 Bath Makeover Giveaway Contest now through November 30, 2018 for your chance to win Gift Certificate worth $10,000 or daily prizes. How To Enter: You must watch select Local 5 newscasts or during Local 5 Live weekdays Nov 12-Nov 30th (except for Nov 22, 2018) for the keyword of the day. Once you know the Keyword now go to this link:wearegreenbay.com/contests and follow the online instructions to register by entering all information requested on the registration form. Prizes: One lucky grand prize winner will win Gift Certificate for a new tub conversion, tub to shower conversion, shower to shower conversion or walk-in tub installation, up to $10,000 in value, redeemable at Tundraland Home Improvements and also there will be fourteen (14) daily prizes, five (5) semi-finalist prizes. Who Can Enter: This sweepstakes is open only to legal residents of the United States and who have reached the age of 18 years old at the time of entry. When To Enter: The Sweepstakes entry begins on November 12, 2018 at 5:00 AM CST and ends on November 30, 2018 at 11:59 PM CST. Who’s Sponsor: This sweepstakes is sponsored by WFRV-TV, 1181 East Mason, Green Bay, WI 54301, and Tundraland Home Improvements, 2277 West 41 Frontage Road. Who reside in AND own a single-family (foundation – concrete/basement/crawl space and pier – based) home in Wisconsin and within the WFRV-TV contour, which includes the following counties Marinette, WI, Oconto, Menominee, Shawano, Waupaca, Outagamie, Brown, Kewaunee, Door, Waushara, Winnebago, Calumet, Manitowoc, Green Lake & Fond du Lac, at the time of entry.